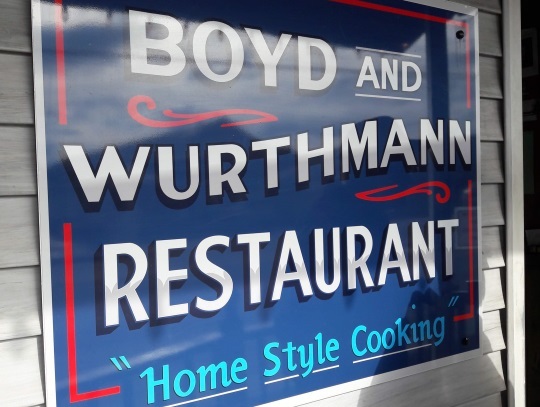 If you’re hungry in Holmes County, you could do a lot worse than Boyd & Wurthmann. 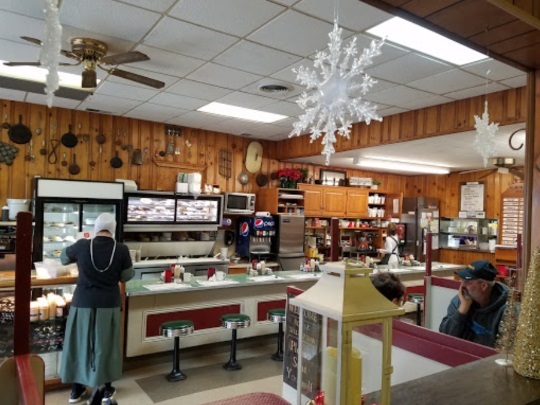 This restaurant, located in “downtown” Berlin, is a local institution, serving up sandwiches and hearty meals for 70+ years. I visited in December, again with my friend Rich Stevick. It’s a circa-1940s restaurant and it kind of has that atmosphere (I wasn’t around then, but I can imagine). I think of Boyd and Wurthmann as a breakfast and lunch place, but they also serve dinner. Rich and I dropped in for lunch (one of several food stops we made, including Charm Sweet Shoppe & Pizzeria). When I go there, sometimes with gaps of years in between visits, this place still seems to keep the same feel. I like places like that. Also I like the name. It’s not promoting itself using an Amish-style description, rather it keeps its”old-timey”-sounding name. It sounds like the name of an old small-town pharmacy or corner store. And it actually has roots of that nature (more below). All that wouldn’t mean much if the food wasn’t good. 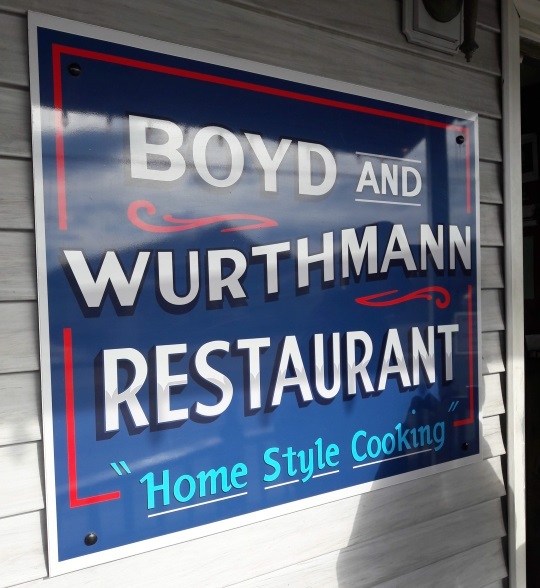 I’d say Boyd & Wurthmann serves classic American food with some Pennsylvania Dutch, Amish-style and local specialties. “The Mess” and “The Wreck” are officially on my radar. 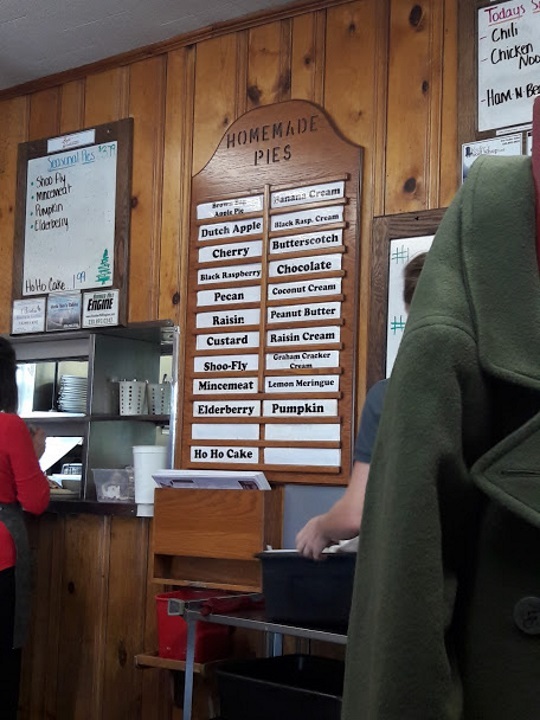 The place is also known for its pies. Here’s the board where they share what’s available that day. Twenty pies! Rich and I got the lunch special, which was some kind of soup, with corn bread. I don’t even remember exactly what the soup was, but it was tasty. The corn bread was great. And they throw in a slab of cheese, why not. I also added a Trail bologna-and-Swiss sandwich. Trail bologna is a local specialty (there’s a place called Trail not far from here). There are usually a lot of English patrons, but Amish folks eat here too. Many of the servers are Amish girls and ladies. No doubt that’s part of the appeal. The restaurant promotes itself as “Where the Locals Eat” on its website. Here’s a wider view shot from inside, by Chuck Yarrish. This is actually about the emptiest I’ve seen the place. It’s usually pretty full, as it was that day Rich and I stopped in. This was taken in November of last year, so right about the same time we were there. Christmas decor is up. The restaurant began as a grocery market, known as Hummel’s Market, in 1938 and was run for 7 years by Paul & Mary Hummel. It was then owned and operated by Herman Wurthmann and Dale Boyd for 40 years and soon became know as Boyd and Wurthmann. In the 40’s, they put a counter in to seat people and began serving sandwiches as well as groceries. The original, green counter built in the 40’s with seating for 9 is still a local favorite and in use today at our establishment. In the 50’s, the demand for more restaurant services increased so they separated the market from the restaurant and began to serve breakfast and lunch. Their specialty was homemade pie and good Amish style cooking. For nearly 40 years, Byrl Wurthmann would come in early and bake fresh all the pies that were served each day. Currently you can expect 15-20 different pies to choose from depending on what fruit is in season. The restaurant soon became the place locals would gather for good food and a chance to catch up with everyone on the local news. 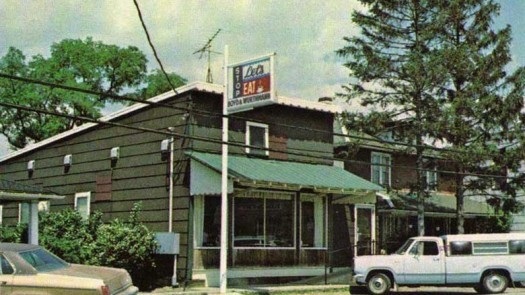 In the 80’s, the combination of good food & the hometown atmosphere began to draw tourists to the restaurant. They began to expand the seating area; today we have a counter, 22 tables, 5 booths, and 1 round table which is the local spot. The restaurant went through various owners until it was purchased by the Dennis Mullet Family in 2004. Here’s another shot of the place from the Boyd & Wurthmann site, from what looks like the 1970s? Open 5:30 AM – 7:30 PM, Mon-Sat. Closed Sundays. Anyone else been to this place? Any menu favorites? We’ve been to this place several times, always a favorite. Everything on menu is very good, you can’t go wrong here. I have been enjoying your website for several months now. Thanks. This is a great place to eat for sure. I don’t know if you’ve ever mentioned this or not. Berlin is pronounce burr’-lin. Most tourists sat Ber-lin’. That’s right Ron. There’s something similar with the word Lancaster. Two words which will tell you if someone is (likely) a local or not. Do they have anything KOSHER? Not sure about that. I don’t recall seeing anything advertised as kosher. I linked the menu in the post if you want to have a look. Careful! Most non-Jewish restaurants don’t have a Mashgiach to oversee the preparation. The bread won’t likely be Pas Ysroel either. If you aren’t as strict so to speak, you could have something vegetarian, of course. 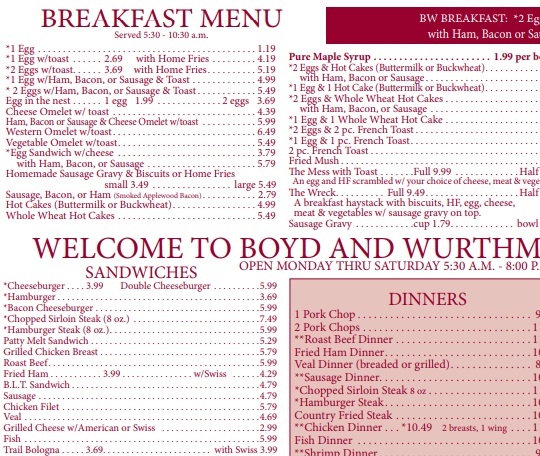 When I first ate at Boyd & Wurthmann the Daily Special was 79 cents, and worth every cent. Has the menu stayed pretty similar over the years? Boyd and Wurthmann has the best omelets in the world! I recommend the vegetable omelet with the white homemade bread toasted. Topped off with the 75 cent coffee, and you have the most delicious breakfast at a very reasonable price. I don’t know of many places where you can still get a cup of coffee for 75 cents. And with free refills. I don’t think I’ve had a cup of coffee for .75 cents in 40 years, wow and free refills. That is awesome. Been to Berlin many times, but the restaurant is always crowded. I’ll have to give it another try. Love Boyd and Wurthmanns Restaurant in Berlin. I have eaten there many times when visiting the area. I will be eating there in two weeks with my husband while being on a Winter Weekend Getaway. I try to eat there every time I go to Berlin and I love it. I remember the first time I went there I was new to Amish country and thought it was so authentic and down-to-earth. Good place to people watch. I remember seeing an Amish lady with straight pins fastening her dress and tasting Amish peanut butter spread for the first time. I was hooked. I highly recommend it! Down-to-earth and authentic are I think why people like this place. I enjoyed reading their history when I was composing this post, and it was neat to see the old photos they have on their site. They’ve got some even older than the one I posted, showing the town of Berlin from what looks like well before B&W was founded. The Date Pudding and Sweet Patato Fries (with sauce!) are delicious!! Never eat that anywhere the same: this is the best!! When in town, I stop in here every Friday AM! I love the place!! We go here every time we’re in Berlin!!! Best food and best service !!! Mmmmm……everything looked delicious. I need to visit Ohio. 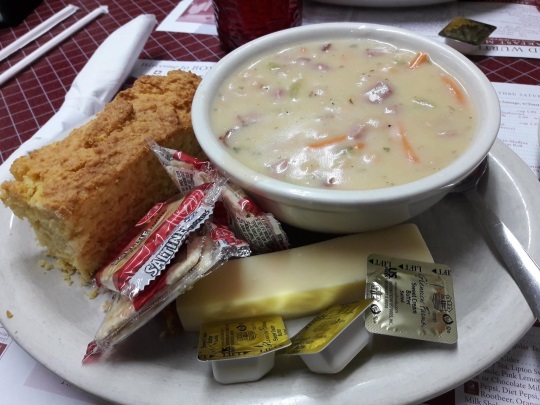 I love this place and visit every time I’m near there – but Wednesday is Meatloaf day which makes it my favorite place and meal rolled in one – the Navy Bean Soup with Cornbread is the bomb and I love to top it off with a piece of Raisin Cream Pie. We have eaten there while visiting Berlin. We both ordered the omelets and they are simply delicious. I would recommend this place to others who haven’t eaten there. You won’t be disappointed. You’re the second omelet supporter on this thread Juanita! Noted for the next visit. We go to Ohio a couple times a year and always stop at Boyd and Wurthmann. Everything we have tried is delicious. Remember to order your pie when you order your meal or it may sell out. We learned that the hard way! Their coconut cream is wonderful! This is one of the few restaurants I will wait in a line for. This is a very apt description of Boyd & Wurthmann’s, Erik. 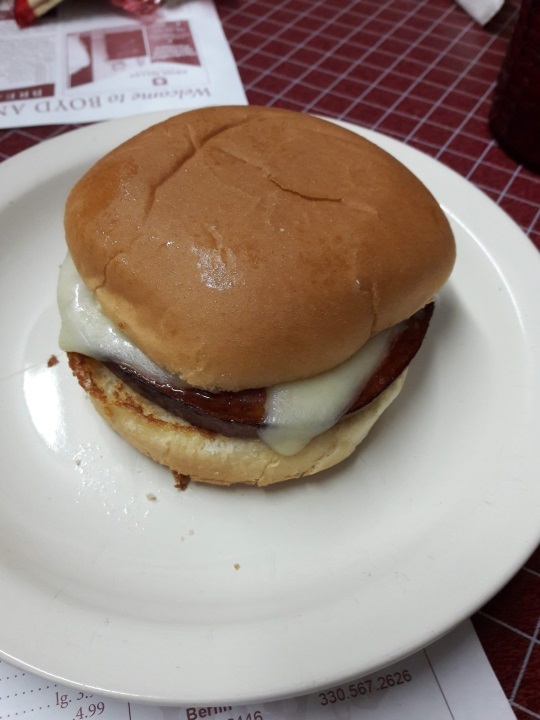 I’ve been to Holmes County seven times in the last twenty-five years and have eaten at least one meal at Boyd & Wurthmann’s each time. And … I’ll eat there again during my next visit to Holmes County. Yum! We used to go there all the time until they started closing a bit earlier so time is a bit too tight after work now. People visiting should know they only take cash (finally put an ATM in) and if you choose a table by the door you will have people waiting in line breathing on your food. We try to sit away from there. 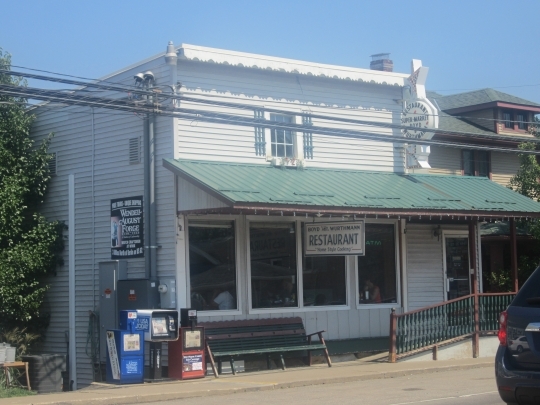 Try their apple dumplings with ice cream, delicious. Sat eve is steak night popular with us locals. Most the pies come from across the street at Der Bake Oven, so if they are out of your favorite (happens a lot), you might find it there.